Flat Gear 210 Beef Up | Tennessee Aircraft Services, Inc.
Fortunately, the single engine Cessna line is known for the strength of the structure around wing attach points, door posts, and the landing gear mount area. Unfortunately, the flat gear 210 series had to sacrifice a significant amount of structure to cut big holes in the belly for undercarriage stowage. The 210B model through the end of the flat gear production 210J in 1969 had extra plates riveted externally for reinforcement around the forward opening of the main wheel wells. This plate has a few shortcomings and is a common failure point. The primary area of concern is the small space from the lower aft cabin door to the upper forward corner of the main wheel well. Much of the landing gear stress passes through this junction and there just isn’t enough material there. The original plate, p/n 1210401-8 left and -9 right, is fabricated using Alclad 2024T-3 of only 0.032″ thickness and a very narrow cross section. In addition, the radius of the inside corner of the plate at the upper forward corner of the main wheel well is less than 1/8″ on some I have seen. The cracks always start in this little corner and propagate towards the cabin door. They may stop at a stray rivet hole on the way, but they eventually make it to the door. 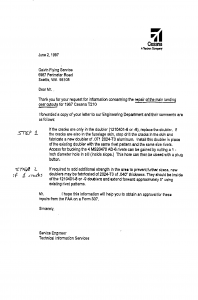 A letter was sent from Cessna to Galvin Flying Service back in 1997 for a specific serial number 210, addressing this crack problem. Before you copy this letter and attach it to any 337, be aware it is not approved data and was never intended as such. 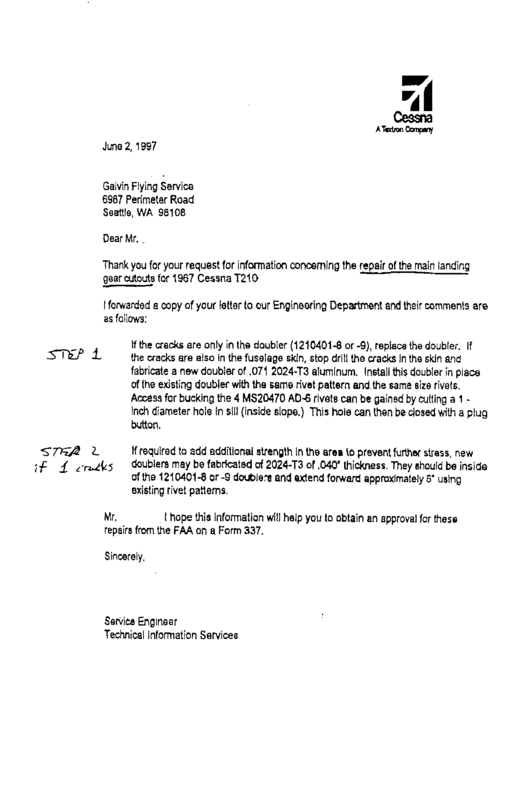 I have found the Cessna engineering department very helpful over the years and are very willing to give a knowledgeable mechanic ideas for repair schemes. These free helpful hints are usually verbal but may occasionally be written as this one was. Approved engineering data will be far more formal and include a lot of information about material replacement percentages, fastener types and sizes, etc. With approved data comes a fairly heavy load of responsibility and liability so you’ll rarely get it for free. Step 1 ignores any deficiency with original 1210401 plate by only recommending replacing it if cracked. You might notice Step 2 addressed the lack of material by adding doublers one size thicker than the original 0.032″. The rest of Step 2 is so vague I can’t be certain where the extra 0.040″ doubler would be added or what shape. These two repairs are sure to solve the problem for a while, but I prefer a slightly different approach. I’ve installed an extra 0.040″ reinforcement and even a 0.063″ piece copying the small radius of the factory’s inside corner. At least one of these has returned several years later with the same crack now visible in the reinforcement. Time for a permanent solution. Since the Cessna letter recommends installing a double thickness plate if the underlying skin is cracked, why not add cross sectional area with a thinner plate with larger radius corner when the under skin isn’t cracked? A proactive approach might mitigate failure of the under skin and look better than a 0.071″ slab of aluminum. This is the side of a 210 with the previous repair plate removed. You can see the paint outlines showing the sharp interior corners at the top of the gear well opening. Drilling off the old plate is simple enough and it will make the perfect pattern for the new piece. We’ll make two significant changes with the new part. The first is a slight increase in thickness to 0.040″. This will add about 22% to the cross section of the plate at the small area in question. From the picture of the original plate you can see there is plenty of room to extend the interior edge of the cut out down and increase the radius to at least 1/4″. This will easily add another 20% to the cross section plus the miracle stress relief effect of the large radius. I could spend a few lines of print explaining how the larger corner radius adds strength, but it might sound like I was trying to be an engineer, which I’m not. A nick in a propeller serves as a very good illustration as it causes very high stress in a very small space. Engineers might call it a “stress riser.” The well known fix is to take away even more material by blending the nick using a file. The blend would extend away from the nick in both directions a distance five to ten times the nick’s depth depending on the location of the damage. This smoothing of the nick returns the blade to near its original strength and stability. So we’ll make our replacement plate 22% thicker, about 20% wider at the necked down area, and add a larger radius corner. This should give more than enough added strength to prevent future cracks. 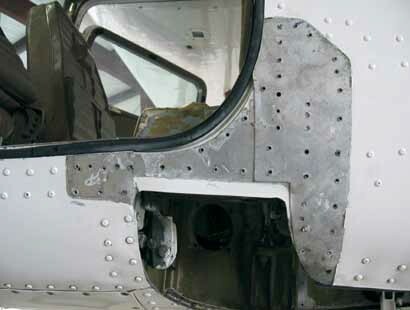 A particular added benefit to this repair scheme is that no extra parts are installed on the plane. We were able to incorporate the repair and replacement in a single part. Most repairs and reinforcements muck up the appearance of the plane. In this case, combining the repair into the replacement part yields an almost original look. After all is said and done, a close external inspection by most 210 owners and mechanics would not reveal the repair. A really well done bit of painting would make the repair all but indistinguishable from the original. 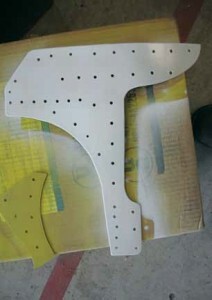 This is the repair plate showing the much larger radius corners. Our planes are getting older and the stresses are adding up. I doubt we’re going to get all that much better at landings, we still have to use the brakes, and tires do get out of balance so care must be taken somewhere. Detailed inspections of the landing gear mount and the surround structure should be part of every annual or 100 hour inspection but a bit more detail may be in order for the older or rough rider piloted planes. Finding a stress crack early can make the difference between a simple inexpensive repair and a wallet busting structural repair event.